Eladio Gonzalez sands and buffs Oscar #3453 at R.S. Owens & Company in Chicago. 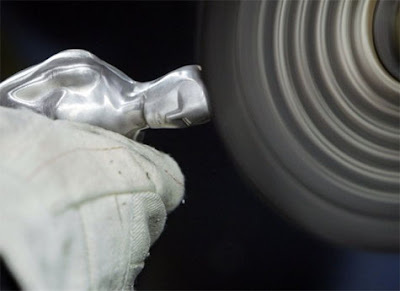 The story of Oscar 3453 began with the transformation of a chunk of metal alloy into a 13 1/2-inch-tall statue at the factory where the statuettes have been made since 1983.